The fact that president Aleksandar Vucic took part in the panel “Freedom of media in crisis” at the World Economy Forum in Davos was scandalous, said Tamara Skrozza, journalist and member of the Press Council. Skrozza also labeled as scandalous Vucic’s “indirect accusation”, at that event, against opposition forces and independent media with regards to the media situation in Serbia. The Press Council monitors the observance of the Journalist’s Code of Ethics, and resolves complaints made by individuals and institutions related to media content. Skrozza told Beta news agency that Vucic should not have talked at that panel because he got negative ratings about media freedom “from all relevant European researchers”. She criticized organizers for their decision to invite Vucic. “There cannot be any justification to invite the person which is also marked by the European institutions as the president of the country where the rights of the media are jeopardized. That’s not just our opinion, this is shown by all relevant researches on media freedom”, Tamara Skrozza underlined. 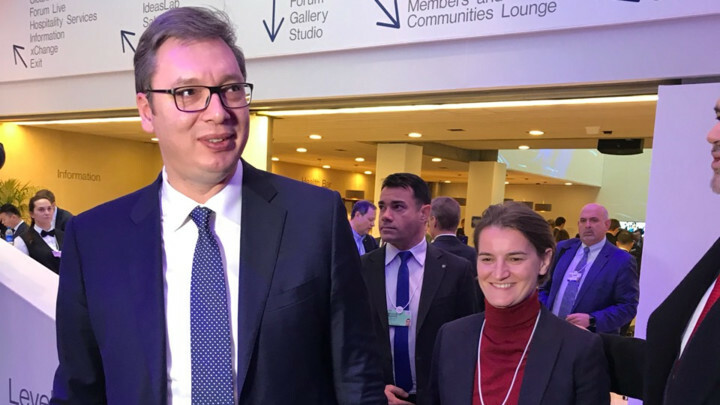 The attendance of Vucic at the World Economic Forum’s panel on media was an “epic cynicism”, said Jugoslav Cosic, journalist and program director of the N1 television. As Cosic told Balkan Insight, in Davos Vucic “created the impression that he was the man who revealed that something is wrong with the media freedom in Serbia”. “The truth is different; he (Vucic) stands behind everything what is wrong. The truth is also that Serbian president and minister for European integration Jadranka Joksimovic were verbally aggressive against N1 reporters who recently asked them about Russia’s Vladimir Putin visit to Belgrade and media freedom”, Cosic said. The representatives of the “Rapporteurs Sans Frontieres” have been the witnesses of that verbal aggression, he underlined.